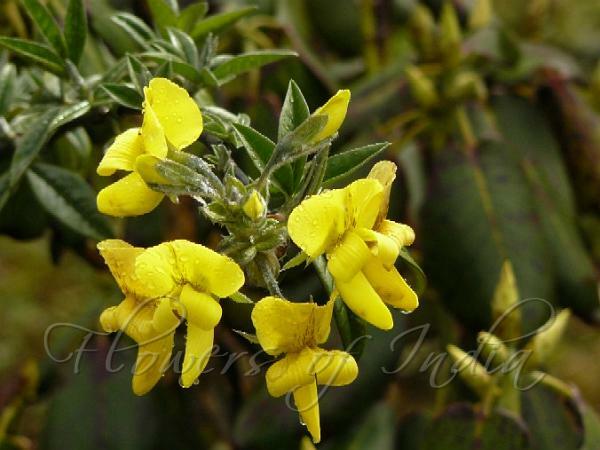 Evergreen Laburnum is a distinctive laburnum like shrub, 3-4 m tall, with dark green shining bark, trifoliate leaves with narrow pointed leaflets, and large bright yellow flowers in short hairy clusters at the end of branches. Flowers are 2.5-3 cm across - the standard petal has a rounded, reflexed blade and a long stalk. Sepal cup is bell-shaped with large, unequal, blunt sepals, which are grey-hairy. Bracts are elliptic, densely woolly-haired. Leaflets are lance-shaped, 3-10 cm long, dark green above and grey-hairy beneath. The underside of the leaflets becomes hairless gradually. 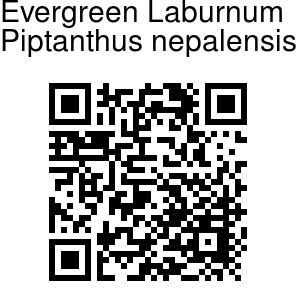 Evergreen Laburnum is found in the forests and shrubberies of the Himalayas, from Himachal Pradesh to SW China, at altitudes of 2100-3600. Flowering: March-May.